Thank God we had Bonifacio Day (Nov 30) falling on a weekend which made our Monday work-free! Just want to share how it went for me and my family. 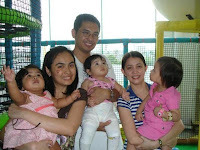 My daughter was back to Kidz Republic in SM Mall of Asia to join Gaby’s party (Ann’s cute daughter). Reese was a little bit shy but tried her best to do her dance moves! My mom visited us and brought our gowns for my sister’s upcoming wedding this month. We had lunch at Cajun (post celebration for Gani’s birthday) and went mall strolling afterwards. Gani and I went to Greenhills to buy some gift items for family & friends. We found a toy store in Theater Mall called “Babe” that offers good quality toys and gives10-30 pesos discount. Gani was able to complete his Kris Kringle list as well (stuffed toy, silver boy-girl key chain and funny toy squirter). I also found nice bags and wallets there but didn’t buy any coz the prices of the items I like were more than 1k! I ended up getting a small purse instead for birthday gift.